Due to some recent Facebook API changes there it is currently only possible to display events that you are a host of and are from a Facebook page that you are an admin of. To do this, you need a Page Access Token for your Facebook page. To display events from Facebook pages that you’re not an admin of see this FAQ for a temporary workaround. We apologize for any inconvenience! 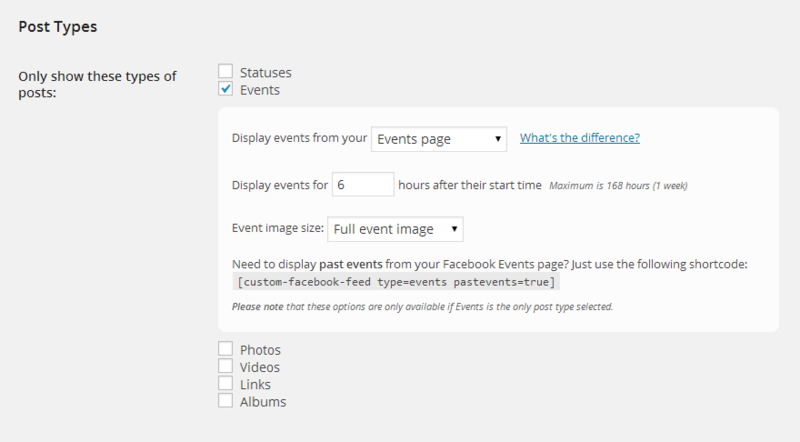 The Custom Facebook Feed WordPress plugin makes it easy to display events directly from your Facebook page. If your primary feed is going to be showing your Facebook Events then you can just uncheck all of the other post types in the Post Types section (Customize page > General). This will then reveal some options only available when showing only the Events post type. They are split up like this to give you greater control over how to display the events, rather than displaying them all in one feed by date order. The plugin contains a range of settings that allow you to control how events appear. These options are available both on the plugin’s Customize page within the WordPress admin and also as Shortcode Options. This is the same setting used when choosing how many Facebook posts to display. Displaying events from your Events page is the best option for displaying events, however, you can also select to show the posts from your Facebook timeline instead – the posts which are created on your timeline when you create an event. This allows you to determine how long an event should be shown for after it’s start time on Facebook. The default is 6 hours, but it can be set up to 168 hours (the equivalent of 1 week). You can decide whether to show the Full event image or the Square cropped version. You can choose to filter your events and only show events which contain a certain hashtag or string. You can also choose to show events which don’t contain a certain hashtag or string. 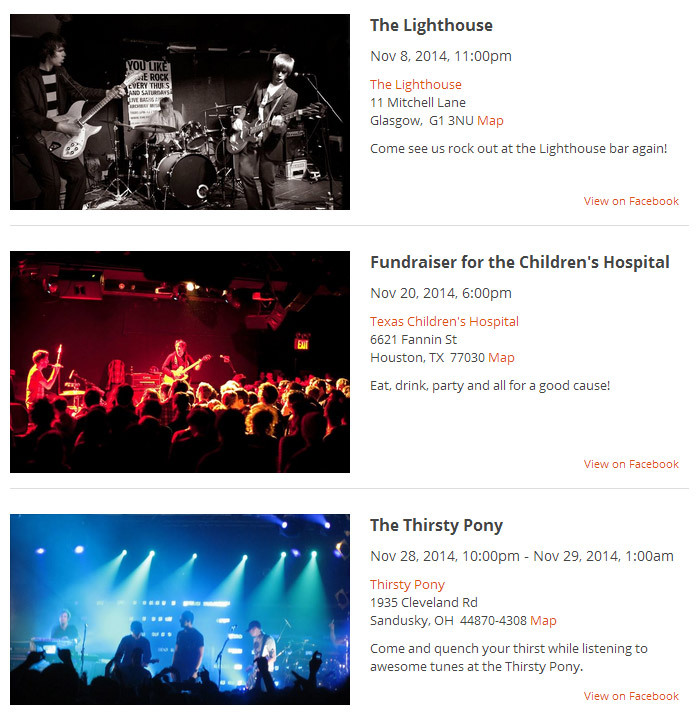 You can choose from either a Thumbnail, Half-width or Full-width layout for your events. You can adjust the percentages accordingly. The first line controls the width of the image and the second line controls the width of the event details. You can select to show or hide the event image, title, details or ‘View on Facebook’ link. Note: You can also change the text or translate the ‘View on Facebook’ link on the ‘Custom Text/Translate’ page. Beyond all of the general styling options built into the plugin (height, width, background color, header etc..) you can also customize specific parts of the events. You can select to choose the HTML format to display your title in, for example, an h3, h4, h5, h6 or paragraph tag. The size of the Event title. The font weight of the Event title. The color of the Event title. Whether to link the Event title directly to the event on Facebook. The size of the Event date. The font weight of the Event date. The color of the Event date. Whether to display the event date above or below the Event title. The date format to display the Event date in. See the Date Formatting Reference for examples. Use your own custom format for the Event date. See the Date Formatting Reference for examples. The size of the Event details text. The font weight of the Event details text. The color of the Event details text. The color of the links in the Event details text. The size of the ‘View on Facebook’ text. The font weight of the ‘View on Facebook’ text. The color of the ‘View on Facebook’ text.